Home > Pasta/Rice/Grains > Chiquilin Spanish Paella Seasoning with Saffron. 20gm. Spanish Paella Seasoning with Saffron. 20gm. Make the most of your favorite paella recipe! A perfect balance of spices, herbs, and exclusive flavor bases. 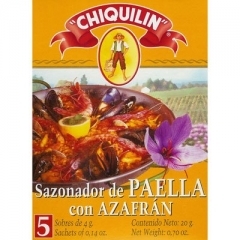 Straight from Chiquilin, Valencia’s premiere culinary herb producer. Each of the bags contains enough paella blend for a medium-sized batch. Team up with our calasparra or bahia rices from Spain.